To accomplish this, I needed to start my training and race season earlier than usual and so why not do it on day one with the New Year’s Revolution Run in Kearns, Utah. This race is not unlike many other fixed-duration races that you see out there, although at 5 hours, it is a bit shorter than most. Still, it does hold some appeal to Salt Lake City locals looking to start off the year on a good note and, for me, represented a perfect kickoff to 2015. This particular race does have somewhat of a “cool” factor (no pun intended) when compared to other track-style races; it is held at the Utah Olympic Oval, home to the 2002 Olympic speed skating events. The running track is a 442m track that extends around the outside of the ice, which gives runners a nice view of the ice skaters and Olympic hopefuls in training. This serves as a great distraction to the otherwise monotonous act of running around in a circle over and over again. In short, it doesn’t erase the fact that you are running in circles around an indoor track, but helps dull the reality a little bit. I look so excited about running around a track at 8am! 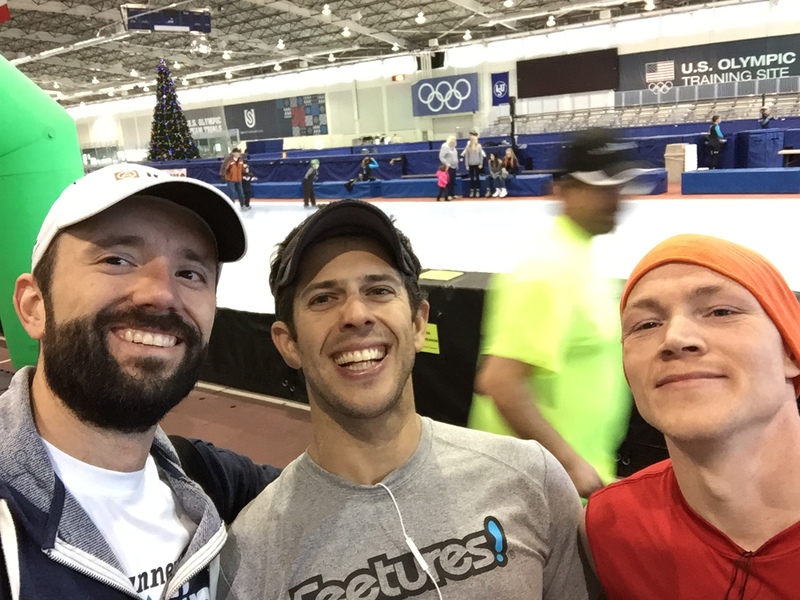 This year, 360 runners towed the line at 8am on January 1st, each with his/her own goals (one could argue that only in Salt Lake City would you ever see that many people NOT still hung over at 8am on January 1st). I was also happy to see that a majority were out there with the intent to go the whole five hours, including a bunch of my ultrarunning buddies from the Wasatch Mountain Wranglers. For me, my goals were simple…stay consistent, go the whole five hours, and run at least a 50K (with 55K being the sweet spot). For the most part, I did what I set out to do. Although I got caught up in the crowd and started out a bit too fast, I managed to settle into a nice pace for the last four hours, staying close to my aerobic zone for much of the event. 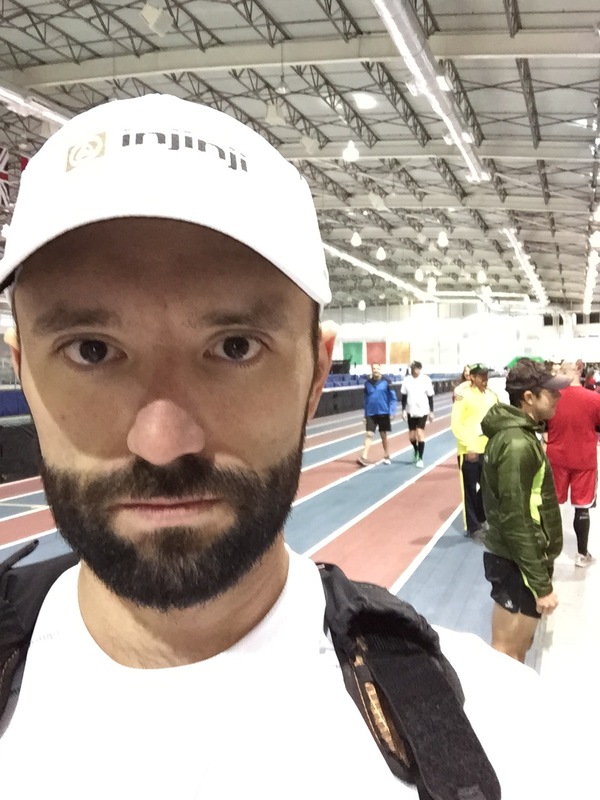 In the end, I managed to run 115 laps, which was a 50K + 1 extra lap for good measure. This was good enough for 10th place overall on the day; not a bad start overall for the 2015 season! Just a few Top 10 Wrangler finishers afterwards! As far as play by play, there really isn’t much to tell about a race that is run NASCAR-style around what amounts to a track that is only slightly longer than a quarter mile. Instead, I will focus more on the lessons learned and what I got out of it personally. First, running around in small circles for 5 hours is a completely ridiculous endeavor. Of course, for me, that was the appeal of this particular race. I signed up for this purely as a mental exercise in preparation for my first 100-mile race in a few months. In this respect it certainly met my expectations. There were times, particularly during the 2 1/2 to 4 hour window, where I was going insane and didn’t feel like doing it anymore. I had to push through it mentally, and that is what I did. My hope is that this experience will serve me well in about 10 weeks when I am suffering through my 100-miler. I can only imagine (and hope) that other fixed-time races that are run on longer, one- or two-mile tracks would be a bit more tolerable. Certainly, if I ever do this format again (which I am sure I will) it will definitely be on a longer course. Second, I forgot how different this type of event is on the body versus the trails. The track surface at the Oval is a carpet material over the top of concrete. It is slightly softer than running on pavement, but harder than a typical outdoor rubber track. Combined with no change of direction and having a repetitive cadence, my legs were definitely beat up the next day, especially my quads and hips. I guess there is probably some benefit to running like this, even for a trail runner, but it definitely reminded me of one of the reasons why I prefer to do all of my long runs on the trails. Lastly, with over 250 people on the track for a good part of the race, it did get a bit crowded at times, but still ended up being a fun social event. It was great chatting with people and seeing so many of my ultra buddies out there running too. In any case, while I without a doubt prefer running the trails, I still had a great time. I think this type of race is certainly something that you shouldn’t hesitate to try at some point. In branching out and doing different things, we can only get stronger and learn more about ourselves as runners and as people. Now time for thanks. First and foremost, my family gets the most props. This race kicks off what is going to be a busy year and their constant support is what makes it possible. Thanks to my 2015 product sponsors, Orange Mud, Injinji, Gargoyles, Honey Stinger, and Virus for giving me the opportunity to represent them and their fantastic products. Thanks to all of my Wasatch Mountain Wrangler friends, some of which joined me on this crazy run. Thanks to all of the race staff and volunteers for their support and in creating an awesome event! This entry was posted in Race Reports and tagged Gargoyles, Honey Stinger, Injinji, Orange Mud, Race Report, Revolution Run, running, ultra running, UltrarunnerJoe, ultrarunning, Virus by Ultrarunner Joe. Bookmark the permalink.